A couple of months ago I saw a Google+ post by Robert Nyman referring to the menu of shortcut keys that appears when you hit the ? key on the keyboard in certain web apps. I think this should be the standard way for all websits/apps. 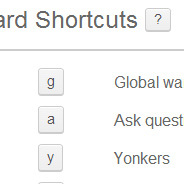 A modal window of keyboard shortcuts is just one way to do that. So over the past 3 or 4 days I hacked together QuestionMark.js. It’s a small script that uses Ajax to display a multi-column layout of shortcut key definitions in a modal window. You’ll also find a version on CodePen, but that one doesn’t use Ajax; the modal content is in the HTML panel. I have no idea if CodePen can do Ajax, so that’s the best I have for fiddling, if anyone wants to improve it in any way. As seen in the comments, Chris Coyier has forked my version and provided instructions to make it work with Ajax. I’ve done the same with my version, so you can fiddle with it in CodePen with the Ajax feature working. To make it work, just customize the question.mark.html page to match your app’s shortcut keys, and include the script and CSS file. As long as the markup is consistent with the example markup already included, you should have no problems. Athough it is (mostly) responsive, there is currently no way that I know of to trigger the modal on a touch device. That could be a future addition. If you have any suggestions for improvements or notice any bugs, file an issue or comment here. Just to clear up how you might to Ajax on CodePen, I forked up your demo and made it work. That’s awesome! I had a feeling there was a way to do Ajax on there, and I was going to ask you. Thanks so much for outlining the steps, that will come in handy for many I’m sure. I got too much information about use of CSS from tour website. Pretty nice plugin! Thanks for that!